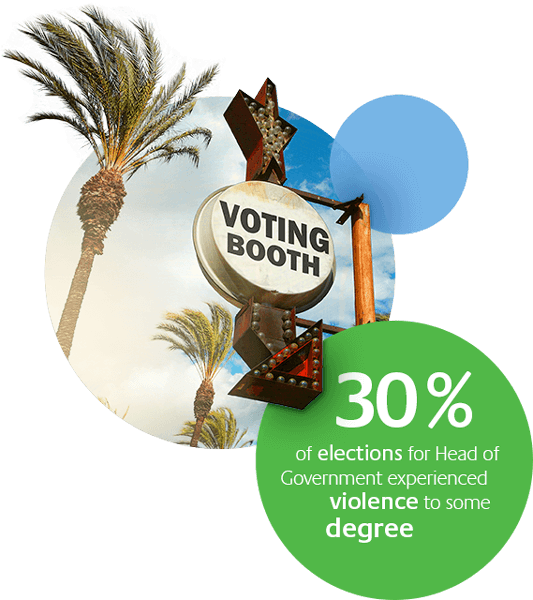 In 2016, almost 30 percent of elections for head of government experienced some degree of violence. With populist and nationalist forces making significant gains in democratic states, 2016 was the 11th consecutive year of decline in global freedom. Latin America and South East Asia face several key elections that are feared may lead to a backsliding of democracy. The advent of new technologies and social media pose new challenges for elections and democracy. The Kofi Annan Foundation presented a report on elections and peacebuilding, enabling countries undertaking peace processes to learn from the experiences of other countries that conducted elections as part of a peace process. In Cameroon, which faces crucial elections in 2018, the Foundation facilitated a dialogue between political leaders, civil society, international partners and the opposition. The Foundation convened conferences in Malaysia and Mexico with political actors, policy experts, civil society representatives and other partners to identify the electoral challenges facing South East Asia and Latin America. Both regions have experienced tremendous economic and social changes in recent decades, creating new challenges to electoral integrity. Throughout the year, Kofi Annan spoke at high-level events on the threats to democracy, underlining the action needed to counter these dangers. In 2018 we will convene leaders from the political and technology arenas to examine the perils and prospects for electoral integrity and democracy in the digital age. This consultation will take the form of a new high-level commission. The commission will build on the work done by the Global Commission on Elections, Democracy and Security, which in 2012 presented a roadmap for safeguarding electoral integrity worldwide.